Filed to: more like iPad No!Filed to: more like iPad No! At today’s big Apple event, the tech company unveiled plenty of new toys for its loyal consumers. Among them was a new iPad Pro - a 12.9” tablet with a beautiful screen and powerful processor. 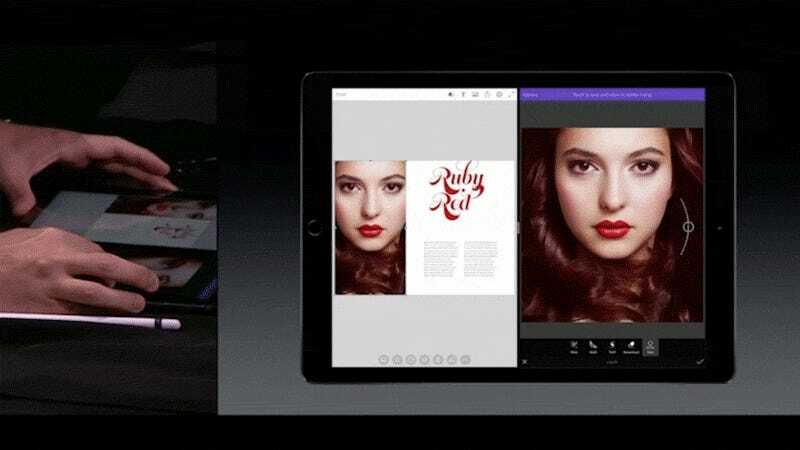 During the live demonstration of a new product called Photoshop Fix (which runs oh-so-smoothly on the iPad Pro), Adobe’s Director of Design shocked the audience by using the software to make a woman look more like Academy Award-winning actress Helen Mirren. The move has sparked plenty of outrage, and is an embarrassing, tone-deaf move from Apple. Not a day goes by that women in this country aren’t told by friends, family—even strangers!—that they should look more like the 70-year-old British bombshell. Women hear this often enough. They don’t need to hear it from some Silicon Valley gadget company, too.